Dr. Jeremy Straughn, Dr. Brandon Van Dyck, Lydia Creech, and Kiva Nice-Webb participated in a panel discussion on Monday at Westminster. Westminster College is exploring relatively uncharted territory by hosting a series of events that will bring together people from differing ideological backgrounds for honest, respectful conversations. Sponsored by the Churchill Institute for Global Engagement, the panel discussions are designed to create a model for other campuses to follow. Dr. Jeremy Straughn, Assistant Dean for Global Initiatives and Director of the Churchill Institute for Global Engagement, explains that the talks — dubbed initially as “Tough Conversations” — are specifically designed to reach across partisan lines. “We hope that by hosting these events, we can develop a model for creating ‘sinews of peace’ on our campus and beyond: relationships that acknowledge difference and allow for an honest exchange of views,” Straughn says. 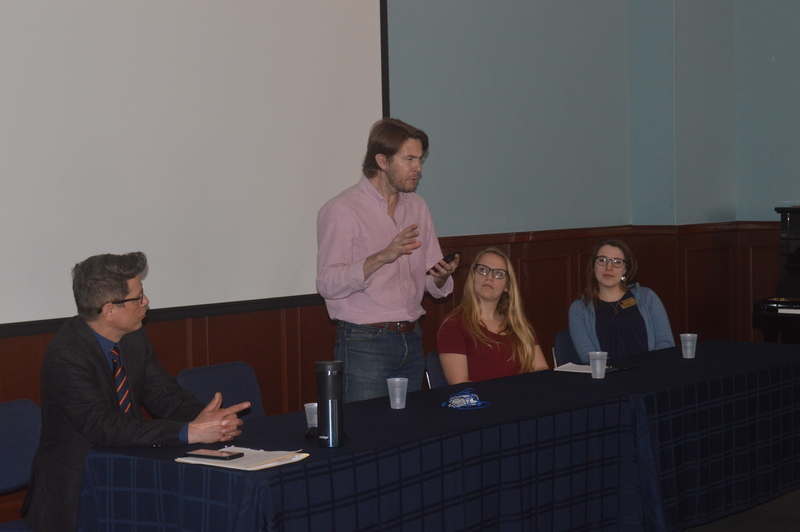 One of the first panel discussions took place in front of a full-capacity audience of more than 50 students, faculty, and staff at noon on April 1 in the Hermann Lounge at Hunter Activity Center. Titled “Free Speech vs. Political Correctness,” the panel included Westminster student Lydia Creech ’19, Chaplain and Director for the Center for Faith and Service Kiva Nice-Webb, and special guest Dr. Brandon Van Dyck of Lafayette College in Easton, Pennsylvania. Van Dyck is a professor of Government and Law as well as founder and president of The Mill Series, which brings to Lafayette College speakers with mostly conservative viewpoints. Van Dyck says that points of view from the right of the political spectrum run counter to predominantly left-leaning viewpoints on most college campuses throughout the United States today. Straughn explains that this particular panel discussion took place after various students said their viewpoints were not receiving the same attention as others. He adds that for balance, the other two panelists from Monday’s discussion were chosen carefully. Creech represented a conservative student viewpoint, while Nice-Webb’s role on the panel emphasized her impartiality on campus in providing a listening ear to all students, regardless of belief. “In genuinely trying to understand one another we need to ask what would it take to engage well? Even in higher ed, emotions are there,” Nice-Webb says, explaining that civil conversation is possible but requires emotional intelligence just as much as rational argumentation. For more information on the new panel discussions or the Churchill Institute for Global Engagement, please contact Dr. Jeremy Straughn at Jeremy.Straughn@westminster-mo.edu.